2015 Ford Mustang EcoBoost engine. 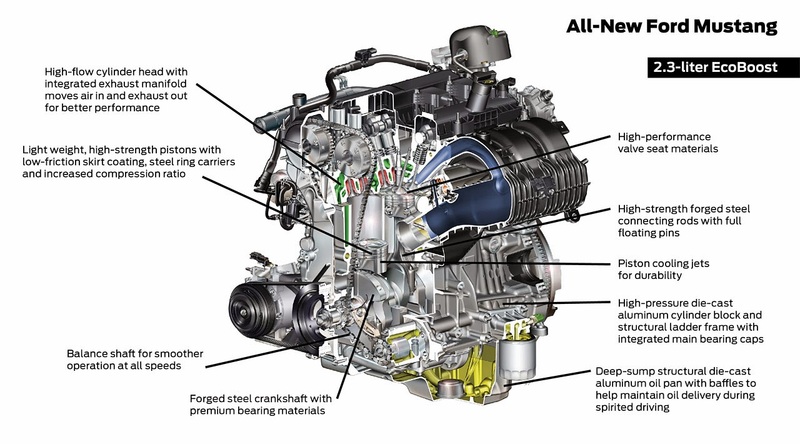 While the new styling of the 2015 Ford Mustang might be the biggest news of the day, the new powertrain lineup is perhaps just as important. A 2.3-liter EcoBoost four-cylinder engine is now an option, joining the 3.7-liter V6 and 5.0-liter V8 that were available in the previous generation. After revealing the initial details for the 2015 Mustang lineup last night Ford has offered up some new details that you can read about below. First up is the 2.3-liter EcoBoost four-cylinder engine. Ford has yet to announce official horsepower and torque figures, but the engine is projected to make 305+ horsepower and 300+ lb-ft torque. It will be the first engine to use a low-inertia twin-scroll turbocharger, providing quicker boost response and improved efficiency. It also boasts the latest in engine technology including direct injection independent variable camshaft timing. Ford has also ensured the engine will be able to produce its power reliably thanks to a forged steel crankshaft, piston cooling jets, steel piston ring carriers, premium bearing materials, upgrade valve seat materials, forged steel connecting rods, a high-pressure die-cast aluminum cylinder block and a deep sump aluminum oil pan. The 5.0-liter V8, while mostly a carryover from the 2011-2014 Mustang GT, has received a few upgrades for 2015. 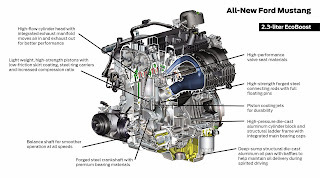 Using much of the information gained from the Boss 302 program, Ford engineers have fitted the V8 with larger intake and exhaust valves, revised intake and exhaust camshafts, stiffer valve springs, an all-new cylinder head casting with improved air flow, sinter-forged connecting rods, redesigned piston tops and a rebalanced forged crankshaft. A new intake manifold also improves air flow to the engine. Ford hasn’t released horsepower or torque figures for the 5.0-liter V8 either, but fully expect the numbers to match or exceed those from the Boss 302. Finally, Ford has implemented several improvements to both transmission options, the 6-speed manual and 6-speed automatic. The manual will receive a new shift linkage for shorter and more accurate throws, and the shift lever is now positioned closer to the driver. The automatic transmission benefits from a redesigned case that is stiffer and lighter. Internal clutches have been upgraded for improved friction, and the output shaft is now better supported for high speed driving. Perhaps most importantly, paddle shifters now come standard, allowing the driver to shift gears without removing his or her hands from the steering wheel. This entry was written by by Anna Nova (Ford Mustang) and posted here on Saturday, December 7th, 2013 at 6:29 am and is filed under 2015 mustang, Reviews. This article was not written by us, rather gathered using RSS feeds listed here. We take no credit for this article. You can leave a response, or trackback from your own site.